Back surgery is only recommended as a treatment for back pain in certain circumstances. There’s a wide range of non-surgical treatments that can help with back pain for most people. These include painkillers, physiotherapy, injections and psychological therapies. You’ll be offered back surgery only if these treatments don’t help or you have a specific condition which your doctor knows would be helped by surgery. There are different types of back surgery. Some may help to relieve back pain caused by wear and tear, which can happen if you have osteoporosis. Others may help if you have severe pain that spreads down your leg (known as sciatica), caused by pressure on the nerves in your spine. 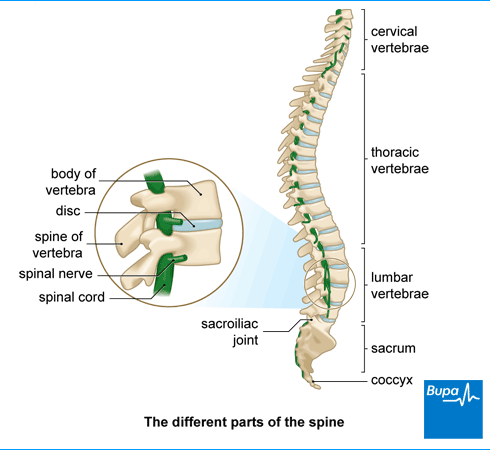 For more information, see our section: Types of back surgery. Your GP can discuss with you whether or not back surgery may help you. This will depend on what’s causing your back pain, how severe it is, and how well other treatments have worked. If they think surgery might be helpful, they'll refer you to a specialist centre for spinal surgery for assessment. The type of back surgery your surgeon may recommend will depend on exactly what's causing your back pain. The three main types of back surgery are discussed below. Lumbar decompression (or spinal decompression) is a procedure to relieve pressure on trapped nerves, which might be causing pain in your back or legs. Decompression can involve either or both of the following types of surgery. Discectomy is a procedure to remove the whole or part of one of the discs between your vertebrae (the bones in your spine). Your surgeon may recommend this if the disc has become damaged and is putting pressure on the surrounding nerves. 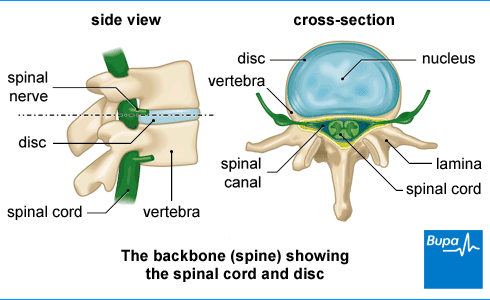 This is sometimes called a herniated or ‘slipped’ disc. This is a procedure to join two or more of your vertebrae together using bone grafts, screws and rods. It’s used to strengthen and stabilise your spine, and prevent painful movements. Your surgeon may recommend this along with decompression surgery if you have a condition called spondylolisthesis (when one of your vertebrae slips out of place). They may also suggest spinal fusion for severe degenerative disc disease (when the discs between the vertebrae in your spine gradually become worn down). Spinal fusion is also a treatment option if you have scoliosis (a condition in which your spine permanently bends to one side). Vertebroplasty involves an injection of glue-like bone cement into your vertebra to repair a compression fracture (collapsed vertebra). This may be caused by conditions such as osteoporosis or as the result of trauma. In a similar procedure, called kyphoplasty, your surgeon inserts a special balloon first to lift the vertebra before injecting the cement. There are other types of back surgery that your surgeon may recommend. They’ll discuss with you what type of surgery is best in your circumstances and explain what’s involved. You'll meet your surgeon or someone from their team before the day of your procedure. They should run through any alternative treatment options with you and make sure you understand the expected outcome of your surgery. They'll discuss what will happen before, during and after your procedure, and any pain or possible complications you might have. This is your opportunity to ask questions so that you understand what will be happening. You can go away and think about it – you don’t have to go ahead with the procedure if you decide you don’t want it. You may prefer to carry on trying non-surgical treatments such as exercise and manual and psychological therapies. See our back pain topic for more information on these treatments. If you do decide to go ahead with surgery, you’ll be asked to sign a consent form (sometimes called an agreement form). Before going into hospital, it's worth making some simple preparations for the first few days back home after your surgery. You’ll be able to walk, but you may need to arrange for some help from family or friends. Think about what help you might need with washing, dressing, cleaning and shopping, for instance. If you live alone, it would help to have someone come to stay with you for the first few days after your surgery, if possible. You’ll also need to arrange to be picked up from hospital as you won’t be able to drive for a while after your surgery. Some time before going into hospital for your surgery, you're likely to be asked to go for a pre-operative assessment. This will involve a general health check to make sure you’re fit for surgery. You may be asked to have some blood tests and an ECG. If you smoke, your surgeon may ask you to stop well before your surgery. This is because smoking increases your risk of getting a chest or wound infection, and also delays bone healing. If you're having open surgery, you'll probably be having a general anaesthetic, so you’ll be asked not to eat or drink anything for about six hours before your operation. It’s important to follow the advice your anaesthetist or your hospital gives you. Once in hospital, you may be asked to wear compression stockings to help prevent blood clots forming in the veins in your legs. You may need to have an injection of an anticlotting medicine as well as or instead of wearing compression stockings. Your surgeon will check that you've given your consent for the procedure, and that you're still happy to go ahead. Most of the time, these procedures are carried out by open surgery. This means your surgeon will need to make a cut into your back to reach your spine. The surgery usually takes between one and three hours, depending on exactly what you're having done. It’s usually carried out under general anaesthesia, which means you’ll be asleep during the procedure. Once the anaesthetic has taken effect, your surgeon will usually turn you onto your front so they can see your spine. Your surgeon is likely to use X-rays to find the affected area of your back. They'll then make a cut in the skin and pull aside the muscles so that they can reach the affected area of your spine. In decompression surgery, the surgeon will work carefully to remove sections of bone, ligaments and disc as necessary to free up the nerves in your back. In spinal fusion, your surgeon will insert a bone graft (a small piece of bone) between two of your vertebrae (bones in your spine) to fuse them together. The graft may be from elsewhere on your own body, from donated bone, or it may be artificial (made out of a material similar to bone). Your surgeon may use plates, screws and rods to help keep your spine still while the bones are fusing together. These two procedures are used to fix compression fractures, usually from osteoporosis, and to strengthen the bone to prevent future fractures. You don't need open surgery for this, it's carried out using a needle inserted into your back. You may have these procedures under general anaesthesia (which means you'll be asleep) or local anaesthesia (which will numb the area). You'll need to lie face down on the operating table and your surgeon will insert a needle into the affected area of your back. They'll use an X-ray to show them where to go. Your surgeon will then inject a special type of cement into the broken bone. If you're having kyphoplasty, they'll inject a special type of balloon first, which can be inflated to create a space for the cement. Doctors are developing new methods for back surgery that are less invasive than the standard techniques. This might mean not needing such extensive surgery, or it could mean avoiding open surgery altogether. New procedures that are being tested include the following. New techniques for laminectomy that involve removing a smaller amount of bone than in the standard laminectomy procedure. Percutaneous coblation. This involves using a heated electrode, inserted into your skin through a needle, to destroy a damaged disc. Percutaneous endoscopic discectomy. These are procedures to remove tissue from a damaged disc, using instruments inserted either through a small cut or a needle in your back. As these are fairly new procedures, only some surgeons with specific training and expertise will be able to do them. Newer techniques such as these need a lot of testing and monitoring to see how well they work, before they can become common practice. After your surgery, you’ll be moved to the recovery room where your nurse will monitor you while you wake up fully from the general anaesthetic. You’ll be given pain relief to help as the anaesthetic wears off. You’ll probably have an intravenous (IV) line inserted into a vein in your arm. You may have a catheter to drain urine from your bladder into a bag. You'll probably have a simple dressing over your wound. With most back surgeries, you’ll spend a couple of nights in hospital. You’ll need to spend some time resting in bed, but will be encouraged to get up and walk around. A physiotherapist (a health professional who specialises in maintaining and improving movement and mobility) may suggest some exercises to help with your mobility and recovery. Your nurse will give you advice about caring for your back and looking after your wound before you go home. You’ll need to arrange for someone to drive you home. You should try to have a friend or relative stay with you for the first 24 hours. The exact time it takes to fully recover from your surgery depends on the type of surgery you've had. It also varies widely from person to person. For standard decompression surgery, you would normally expect to be free from pain and able to do gentle exercise by 6 weeks. You should be able to do most of your normal activities within 12 weeks of your operation. It can take several months for your bone to grow after a spinal fusion procedure. However, you're likely to feel better sooner than this. You'll be taught how to move around in a way that will keep your spine aligned during this time. For vertebroplasty and kyphoplasty, you should be able to get back to your usual activities straight away. Newer techniques that don't involve open surgery should also have a quicker recovery time. The rest of this section refers to recovery from open surgery on your back. Once you’re home, it'll help your recovery to keep to a normal daily routine of getting up and dressed at the usual time each day. Try to move around the house and eat and drink as normal. It’s important to build up your activities gradually but if you feel tired, stop and rest. You’ll need family and friends to help you with the practical tasks you’ll find difficult for a while such as cooking, cleaning and shopping. In the first week or two after open surgery on your back, you may still need some pain relief. You can take over-the-counter painkillers such as paracetamol or ibuprofen. Always read the patient information leaflet that comes with your medicine and if you have any questions, ask your pharmacist for advice. If you've had open surgery on your back, you'll have a dressing over your wound. You'll need to wash carefully around this, so that the dressing doesn't get wet. If you've had stitches or staples, these will need to be removed about 10 days after surgery. You'll be able to bath and shower as normal once they've been removed. You'll have a small scar on your backbone after the operation. It's important to keep moving after open surgery. Your physiotherapist will show you exercises to do while you recover. These will help you get back your strength and movement and avoid stiffness. It’s important to follow your physiotherapist’s advice. Your surgeon may ask you to restrict certain activities and movements for a period after your surgery. For instance, they may advise you to avoid heavy lifting, awkward twisting or bending forward for up to four weeks. They may also recommend that you don’t sit or stand in one position for too long. Aim to build up the amount of exercise you can do, starting off with light exercise and gradually getting back to your normal activities. For more information on playing sports after back surgery, see our FAQ: Sports after back surgery. You may be able to start driving again for short periods of time about six weeks after open surgery on your back. However, you shouldn’t drive until you can safely control your vehicle, including doing an emergency stop. Don’t drive if your painkillers make you drowsy. Tell your motor insurance company about your operation and check what your policy says about driving after surgery. Time off work depends on the type of surgery you’ve had and what your job involves. Most people can return to work about four to six weeks after open back surgery. If your job involves driving, heavy lifting or other strenuous activity, you may need 12 weeks off. Ask your surgeon or occupational health team what’s best in your circumstances. Having an operation can take a lot out of you, so you may feel tired and a little upset or emotional after your surgery. Don’t worry, this is completely normal and many people experience the same reaction. Having company and getting back to work as soon as you’re able to, should help. Complications are when problems occur during or after your operation. All surgical procedures come with some risks, but how these risks apply to you will be different from how they apply to others. Ask your surgeon about the chances of complications in your circumstances. Some complications can happen after any major operation. For example, it's common to develop a chest infection, especially if you smoke, or an infection in your wound. There’s also always a chance you might get a blood clot, usually in a vein in the leg (deep vein thrombosis, DVT). Your surgeon will aim to keep your chance of developing these complications as low as possible. Complications specific to back surgery depend on the type of surgery you have but may include the following. Infection of your wound or, rarely, the tissues around your spine. If you get an infection this can be treated with antibiotics. Contact your GP if you have increasing pain, redness, tenderness or swelling around your wound or if you get a high temperature. Bleeding during your operation. If you lose a lot of blood you may need a transfusion. Damage to the nerves, blood vessels or other tissues at the site of your surgery. Tearing of the membrane covering your spine. The watery fluid that surrounds your spinal nerves (cerebrospinal fluid, CSF) can leak out. Your surgeon will mend the tear if they see it during surgery. Sometimes this tear causes headaches afterwards but these usually improve with time. A swelling of blood (haematoma) developing near your wound – this may need surgery to resolve it. If you had spinal fusion, the graft, rods and screws may break or move out of place. This would need another operation to resolve. You may also need a second operation if not enough bone forms. With vertebroplasty and kyphoplasty, there may be leakage of the cement used in the procedure, or you may have a reaction to it. If your symptoms recur after surgery or, in the case of a slipped disc, another slipped disc happens, you may need further surgery. If you have concerns about possible complications of your back surgery, discuss these with your surgeon. You should also contact the hospital if you have a high temperature, ongoing or worsening pain, numbness or muscle weakness which is new to you, or problems passing urine. There are lots of different things you can do to help your back recover after surgery. It's important to eat a well-balanced diet to give your body the nutrition it needs to heal and stay healthy. It's not a good time to think about dieting – focus on trying to eat plenty of nutritious foods and make sure you're keeping hydrated. If you smoke, try hard to stop, even if it’s just during the time that you’re recovering. This will improve your circulation and breathing, as well as helping you to heal. Accept help from family and friends. You’ll need them at first to assist with the tasks you can’t manage and later on their company will help keep your spirits up. Set a daily routine and keep to it. Get up and dressed at the usual time each day, even if you have to rest later. Try to move around the house as normal, taking it easy at first. Gradually build up your normal activities. Start with light exercise such as walking. Then you can try to do more and more. Be careful not to overdo it, and have a rest if you become tired. Aim to get back to work as soon as you safely can. Getting back to work can actually help you to recover more quickly. Being off work for a long time can make you feel isolated and depressed. Depending on the nature of your job, it may be best to return to work doing lighter duties at first. Talk to your employer about this. Give yourself time, and expect to feel tired and even emotional sometimes. Rest when you’re tired but stay positive, and gradually try to build back up to your normal daily life. Remember, everyone recovers at their own speed and in their own way. Will I be able to play sports after my back back surgery? Will I be able to play sports after my back back surgery? Yes, you usually can, but only after your spine has had a chance to recover. From about 12 weeks after surgery, most people will be back to all their normal activities. This includes everything other than contact sports. Ask your surgeon what they recommend in your circumstances. From two weeks after your back surgery, you can usually start taking short walks. Try having a 10-minute walk in the morning, and another in the afternoon. From about six weeks, you may be able to start activities such as swimming, which cause very little strain and pressure on your spine. Depending on the type of surgery you had, you may be able to be back to normal activities after about 12 weeks. You won’t be ready to take up contact sports yet, though. If sports are important to you discuss this with your surgeon at the time of your operation. They’ll be able to give you the best advice about when and how to take up your particular sport again. It’s important to follow the advice you’re offered. Your bones become weak, brittle and more likely to break, and you'll usually lose bone density.